Glass Management Kit (GMK) The original and the best! 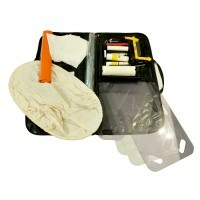 The GMK was developed by Big Red Truck over 10 years ago specifically for providing all the necessary tools, covers and boards needed to protect rescue crews and patients from injuries resulting from sharps and glass at road accidents. The original and the best!